"Before getting into the detail of their game, it’s crucial to understand just how much of it comes from Guardiola. When a Barcelona vice president mused to me four years ago that she’d like to see the then 37-year-old Pep be made head coach, I never imagined it would happen. Guardiola was practically a novice. The only side he had ever coached was Barça’s second team. However, people in the club who had worked with him – men like the club’s then president Joan Laporta, and the then director of football Txiki Beguiristain - had already clocked him as special. 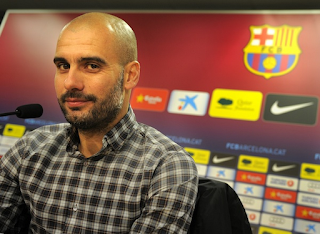 Not only did Guardiola know Barcelona’s house style inside out. He also knew how it could be improved." More from this highly detailed and fascinating article by British author Simon Kuper here. Barcelona flamenco singer's "Kamikaze project"